In case you hadn’t heard, Cape May is Christmas Central in December. Nowhere else can you find the combination of charm, festivity, entertainment, great dining, and nostalgia that come together every Christmas season in Cape May. At the risk of sounding biased (I am, by the way), The Queen Victoria leads the way with unbelievable decorations and a festive, holiday cheer that you just can’t find anywhere else. Of course that festive feeling and holiday cheer has a lot to do with our fun loving guests who so frequently return to experience the Cape May Christmas Phenomenon each year. In addition to these Marquis weekend events, there are various Christmas tours daily throughout the season, including the “Holiday Lights Trolley”, “Lamplighter”, “Holiday Inns”, and the very special “Cheery Cherry House” tours. Even though we have a few fully booked weekends in December already, it is not too late for you to make plans to enjoy this most festive of seasons at The Queen Victoria this year. Don’t wait too long, though … or you might be too late! Last Minute, Special Booking Opportunity! A few minutes ago (literally) we took a cancellation for this coming Saturday night, Nov 12. We now have Balmoral, a beautiful, luxurious room that was completely renovated this year, available for Saturday night (1 night) for the first of you to claim it. Call us or book it online. The weather looks great, it is Jazz Festival weekend, and the shopping and dining will be terrific, as usual. Since Gilbert & Sullivan is one of my favorite rooms at The Queen Victoria, I was stunned to discover that I hadn’t featured it since August of 2008. I can’t imagine why. So what makes it one of my favorites? First of all, as a 2 room suite, priced at the lower “Large Standard” rate, it is probably the best value in the inn. Gilbert & Sullivan also has some wonderful features, like a beautiful fireplace in the sitting room, separate air conditioning systems in the bedroom & the sitting room, and LOTS of windows, which allow for a lot of light and some great cross breezes. Gilbert & Sullivan is located at the end of the hall on the 2nd floor of the Queen Victoria building, in the back of the house. Being a two room suite, it is particularly popular with couples who have slightly different sleep schedules, allowing one of them to stay up later or get up earlier than their partner. By the way, the large flat-panel TV sits on top of the fireplace, but our photographers hate televisions in their shots, so it is not evident in this photo. If you’re looking for the ultimate Christmas Season experience, filled with festive Christmas decor, wonderful hospitality, incredible entertainment, and joyful camaraderie, then you would be hard pressed to find anything which even approaches the annual Cape May Dickens’ Christmas Extravaganza, especially when you stay at The Queen Victoria. 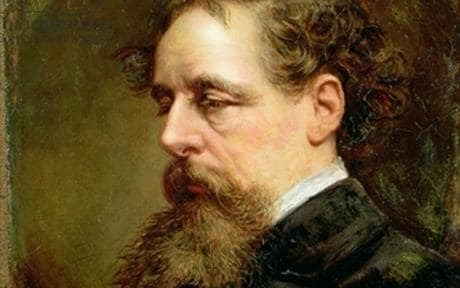 (I just realized that the previous sentence was typical “Dickens”; long, with lots of commas, and somewhat difficult to follow all the way to the end). This annual event features three days of performances, lectures and presentations. Sunday night we kick things off with an “Innkeeper Welcome Dinner”, where Anna Marie and I treat all of the participants staying at The Queen Victoria to dinner at the Merion Inn. Following dinner on Sunday is the first performance by world-renowned lecturer Dr. Elliot Engel*. For those of you worried that a lecture by somebody with a “Dr.” in front of his name might be dry, take cheer. Elliot Engel could literally have you laughing hysterically with a reading of a dictionary. Monday follows with more presentations by Dr. Engel, and then the guests of The Queen Victoria are treated to a special hors d’oeuvres reception in place of afternoon tea (BYOB). On Tuesday the festivities continue with more presentations by other knowledgeable speakers ** on several fascinating topics. Festivities conclude on Tuesday evening where you’ll enjoy the “Dickens’ Feast” at Union Park (BYOB) in the company of your fellow participants. We’re talking about 3 days of wonderful entertainment, two great meals out and a special reception, all for the cost of $175/person (in addition to the cost of your room). Even better yet, you can take advantage of our “222” discount package for your Sunday through Tuesday reservation, making the entire experience incredibly affordable. We have many guests who participate in the Dicken’s Extravaganza every year. One of the reasons that Anna Marie and I enjoy this event so much is that they are such a fun group of people. I’m sure you would fit right in! * Dr. Elliot Engel’s mini-lecture series on Dickens ran on PBS television stations around the country and his articles have appeared in national newspapers and magazines including Newsweek. ** Also featured are lectures by members of the Philadelphia Dickens Fellowships. Anna Marie and I have been taking questions about the Christmas season for months now. It seems like everybody has heard about just how special and festive Cape May is at Christmas. It’s true. Christmas in Cape May is a BIG deal. It is so big, in fact, that we really can’t fit all of it into the month of December. Though we don’t kick things off quite as early as the retailers, the Christmas Preview Weekend (pictured here) gets things started with the lighting of the Christmas Tree at the Emlen Physick estate on Saturday, Nov 19. This is also the day that the Trolley Christmas light tours begin. That Saturday evening is also the only time that the Emlen Physick estate, all dressed up in its Christmas finest, is open to the public for free tours. All through December, including New Year’s weekend, each day is filled with wonderful Christmas oriented tours, including the fantastic “Candlelight Tours” the first 3 weekends of December, “Holiday Inns Tours”, “Lamplighter Tours”, and of course the “Christmas Lights Trolley Tours”. If you haven’t experienced Christmas in Cape May, then you really haven’t experienced Christmas. At the risk of sounding boastful, The Queen Victoria is probably the best decorated group of buildings in the city, and Christmas cheer is found throughout the inn. As special as the Christmas Season in Cape May is, even more special is Christmas at The Queen Victoria. Every year dozens of guests make The Queen Victoria their home for Christmas. For many it is an annual event, which they look forward to every year. Many families, separated by the miles, have discovered that The Queen Victoria is the perfect central celebration location, one in which nobody is responsible for cooking, cleaning, or entertaining … everybody just gets to have fun together. Christmas at The Queen Victoria is also for couples experiencing “in-law” years. They’re the ones whose married children alternate holiday celebrations between families, leaving at least one set of parents without children to celebrate Christmas with. No matter what reason our guests choose to celebrate Christmas at The Queen Victoria, they always have a great time. It is Cape May, after all, all dressed up for Christmas. I’ll admit it, Anna Marie and I really enjoy wine. It’s no wonder, then, that our Wine Lover’s is one of our very favorite special events of the year. As much as we enjoy wine, however, I have to say that most of our enjoyment of the event has to do with the experience itself, the time spent with interesting people exploring the process of wine blending together. It is just an incredibly fun event. Our Wine Lover’s wine blending party is held annually at Cape May Winery, in the charming barrel room that you see pictured above. The room is set up with the round tables you see here, each one set for 4-6 people. The people seated at each table will find 3 or 4 glasses of red wine sitting in front of their seat, each one filled just enough for a good taste or two. The event starts off with an introduction by one of the staff, and proceeds to a tasting of the wines in front of everyone. Everyone evaluates each one, trying to identify characteristics of each that might contribute to a great wine blend. Once that is completed, each table starts working to create the perfect blend of the wines on the table. Usually each participant at each table will suggest at least one blend, which will be mixed, tasted, and evaluated by all present. Eventually a selection of the best blend is made by each table, and is submitted to the attending staff member. All participants then enjoy a tour of the winery & production facility, and return to find decanters of each table’s blend distributed across all the tables. The culmination of the event is the blind tasting of each blend by all participants. A show of hands determines everyone’s favorite, which is bottled once the winemaker thinks the wine is ready and labeled with custom labels featuring a picture of The Queen Victoria and whatever text each guest specifies. Each participant gets one bottle of the blended wine with the price of admission, though additional bottles can be purchased as well. You’ll be pleased to know that along with all the wine that will be present in the room, there will also be a wonderful Italian platter filled with high quality cheeses & meats from Cappelletti’s Deli in West Cape May. We want you to be well fortified for your wine blending adventure. This really is a great way to spend a chilly winter afternoon. Many couples over the years have given this event as a gift to each other for Christmas, which I’ve always thought was a great gift idea. Maybe you do too! I believe that cheese is perhaps mankind’s greatest culinary invention. Over the years my appreciation of different cheeses has grown, eventually reaching the point where I love just about any cheese available. The thing is, there are SO MANY types of cheese to try. That is why we came up with the Big Cheesy cheese tasting party that we hold every March. Anna Marie and I probably have almost as much fun buying all of the 16 some-odd cheeses that we feature each year, as we do tasting them. We search high and low for interesting and obscure cheeses that we think you’ll really enjoy trying. Admit it, when I say “Cheese”, the next word that comes to mind is “wine”. Am I right? It is very hard for me to contemplate a cheese tasting party without wine, which is why we encourage everybody to bring a bottle of wine to enjoy at the party. We’ll set up a spot on the buffet for all the wine, and provide the glasses and corkscrews. Sharing a good bottle of wine with friends often makes it a great bottle of wine, so bring one you would like to share. Remember, you’ll get to share everyone else’s wine too. I guess I’ve said this before, but I don’t mind repeating myself. This is a terrific way to spend a winter weekend. What else would you rather do? A few years ago we celebrated Anna Marie’s significant birthday (I’ve conveniently forgotten which one) with a party at The Queen Victoria. It was especially fun because we turned it into a “March Birthday” celebration for several of our guests celebrating birthdays that month. They reserved a room for a fun weekend in Cape May and we had a big party for everyone. It was such a great time, in fact, that we decided to repeat and expand the event. In 2017 we’ll be throwing a birthday party every month, January through April to celebrate the birthdays of any of our guests born in those months. If you’re going to be celebrating a birthday in winter/early spring 2017 and you’re looking for a fun way to do it, I suggest a trip to The Queen Victoria. If you don’t have a winter birthday to celebrate, but are looking for an excuse to make a trip to Cape May, you’re welcome too! Book a room and join us, we won’t be checking IDs. Booking Hint: Take advantage of our “Winter Escape” package and give yourself a nice discount for the January, February & March events (discount not available President’s Day weekend)! It is hard to believe that we’ve been enjoying this wonderful event for nearly 10 years! We’re thrilled to announce that Singer Songwriter Cape May is returning again this Spring. This event is an amazing opportunity to enjoy a music filled weekend all over Cape May, mostly for free (only the 2 headline concerts charge an admission). There are typically about 150 performances in venues throughout Cape May. One of the perennial and premier performers at Singer Songwriter Cape May is Avi Wisnia (the gentleman pictured above). Avi is an incredibly talented and interesting songwriter and musician, who will once again be performing an exclusive concert for our guests on Saturday, March 25 in the parlor of The Queen Victoria building. This concert is also free, but is limited to those guests with rooms reserved for the weekend. This year’s performance will be Avi’s 3rd annual concert at The Queen Victoria, and we’re very excited to have him back. Avi will also be staying with us at The Queen Victoria, so you may well have an opportunity to chat with him at breakfast too. Don’t wait to make your reservations for this weekend. We are always fully booked for the Singer Songwriter Cape May weekend. It seems that I’ve been featuring lots of “New Stuff” being done at the Queen’s Cottage lately. Last month we were installing some new wireless internet equipment (I could have featured that, but as exciting as a reliable wireless network is, it doesn’t make for much of a photo *) and I noticed that our dormer window on the third floor of the Cottage was looking a little worse for wear (or weather as the case may be). It actually started with the tin roof I had been standing on, but once up there we noticed lots of things that needed some love. 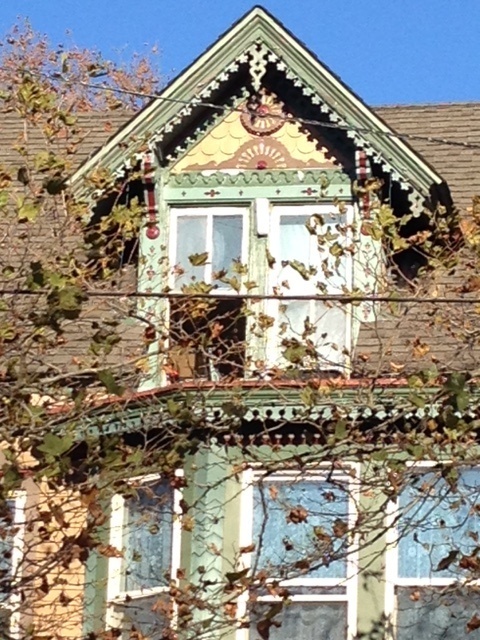 In fact, we ended up having to recreate most of the gingerbread you see above the windows in this picture. I’m pleased to say that the resulting new gingerbread ornamentation, some of the most intricate in all of Cape May, came out looking great. In keeping with the historical requirements in town, we crafted them all from solid mahogany, which is the most weather resistant wood that we know of. While most of our buildings have a 3 color paint scheme, the Cottage actually has 6 different colors. Make sure you take a peek up at the dormer during your next visit so you can admire this old-world craftsmanship in person. * Those of you with a really sharp eye might notice the white rectangular box attached between the two windows, towards the top. That is the receiver for the wireless bridge of our new wireless network, bringing you more reliable, faster internet during your visits to The Queen Victoria. Once upon a time I posted quite a few beautiful sunrise photos that I had taken from our lovely beach. It has been a while since I’ve had that opportunity, so I was thrilled when our long time guest Jean shared a couple sunrise photos that she took during her morning walks in early November (last week). I’ve always been of the opinion that a few clouds are necessary to insure a dramatic sunrise or sunset photo, but Jean’s creative use of the dune grass to give the photo some contrast has shaken my long standing opinion. This really is a lovely photo which clearly articulates just how beautiful a sunrise in Cape May can be. Strictly speaking, a Gift Certificate to The Queen Victoria is not really a gift shop item, but since they are the ultimate gift idea, I couldn’t resist featuring them in this article. One of the major attractions of Cape May during the Christmas season, beyond the generally festive, seasonal atmosphere in town, are the wide variety of tours offered. 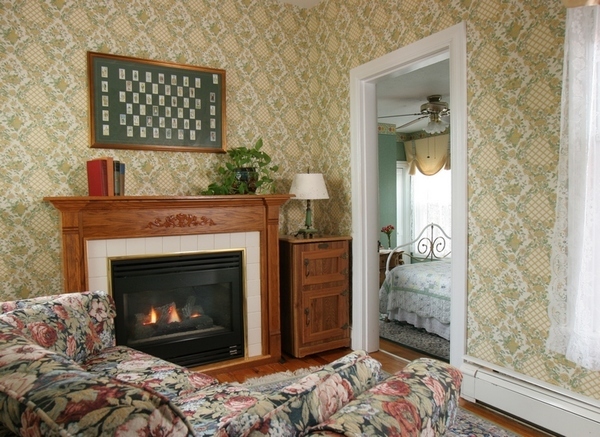 Starting on November 18th, and running right through New Years, there are several opportunities to explore the interior decorations of both private homes and bed and breakfasts throughout Cape May. I know that you would enjoy any of them, so start planning to include at least one in your plans for your Christmas season visit to The Queen Victoria. 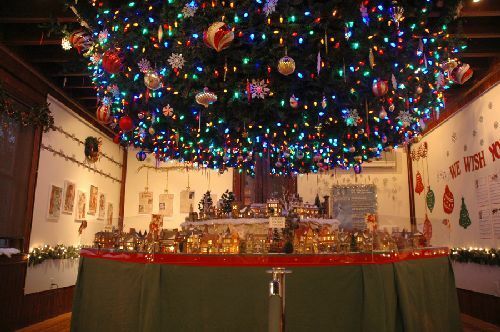 By the way, the image above is of the Dickens Studio 56 “Under the Tree” Christmas display, which is located at the Physick Estate Carriage House Gallery. It is free to tour every day of the week during the Christmas season. The Ebbitt Room has long been considered one of Cape May’s finest dining establishments. It is certainly a favorite of Anna Marie’s and mine. As soon as you step into the dining room you sense that this is a special restaurant. The decor is lovely, interesting, and welcoming. You can’t really tell from this photo, but much of the wall decor is made up of vintage plates, which I’ve always found fascinating … simple, creative, and interesting. Of course, your main interest is going to be in the food they serve, which is exquisite. Let’s start with the appetizer course. Anna Marie’s favorite selection is the “Beach Plum Farm” Deviled Eggs. My perennial favorite is the Pale Ale Calamari, which I honestly believe to be the best on the planet. Anna Marie favors the Pan Roasted Ora King Salmon for her entree, while I’m partial to the Roasted Swordfish or the Barrel Cut Ribeye Steak. We don’t usually make it as far as dessert, but I’m not sure I’ll be able to resist either the Sticky Toffee Pudding with warm Toffee sauce, or the S’mores Parfait on our next visit. One of the things that we really love about the Ebbitt Room is their commitment to “farm fresh” and local foods, much of which comes from the Beach Plum Farm. That changes by season, of course, but we always appreciate eating “local”. As you may know, Anna Marie and I really favor BYOB restaurants, which the Ebbitt Room is NOT. Fortunately, this last October, and starting up again in December, Wednesday’s were (will be) BYOB night, with no corkage fee. Look for us there on Wednesdays in December! Located in the Virginia Hotel on Jackson Street, the Ebbitt Room is an easy walk from The Queen Victoria.